Critical question #1 – What bath and shower products do you offer? Critical question #2 – How do you “edumacate” (educate to most people) yourself? You might be asking what kind of word is “edumacate?” Well this is a word my Dad made up for education. You see my Dad immigrated to this country from Italy and only had formal schooling through the 8th grade. Given this challenge (and coming to a new country) he knew self-education (or edumacation as he called it) was critical to his success in the United States. I could remember him telling people he came into contact with he was just a “dumb greenhorn off the banana boat.” Anyone who believed that had to be crazy. My Dad – while not formally education – did not believe in the saying when the student is ready the teacher will appear. He believed if you want to be the best in your field you go out and find the education (or edumaction as he used to say) yourself. Maybe that’s why he was able to grow a multi-million masonry construction business starting out with just a beat up old truck and a large dose of desire. If they give you a big old blank stare, you’ll known everything you need to know. Progressive and smart contractors are on top of the new trends and products. Critical question# 3 – How can you make sure this bathroom works well for me over the long run? Here’s the problem. Life’s unexpected twists, turns, surgeries, family challenges get in the way. Maybe a family member (God forbid) has a stroke, heart attack, gets into an accident and now needs a bathroom which will work for their current abilities. Maybe it’s best to have Mom or Dad come live with you and they aren’t quite as mobile as they used to be. Forward planning in a bathroom remodeling project can allow your space to work flawlessly even when life throws you a few lemons (and my guess is if you’re like me you’ve already been challenged to make lemonade out of a few of life’s lemons!). If you have a bathroom remodeling contractor who is familiar with universal design remodeling (i.e. designing spaces to work for people of all abilities) you can create a cool space which will work over the long run (no matter what curves get thrust upon you). 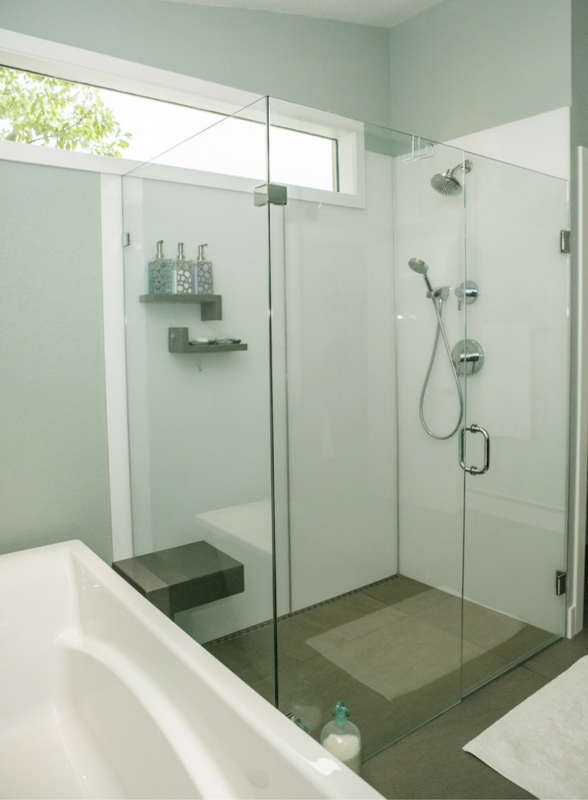 Ask your contractor what thoughts they have to make your bathroom functional over the long run. See if they know about products like one level wet rooms and barrier free shower pans. 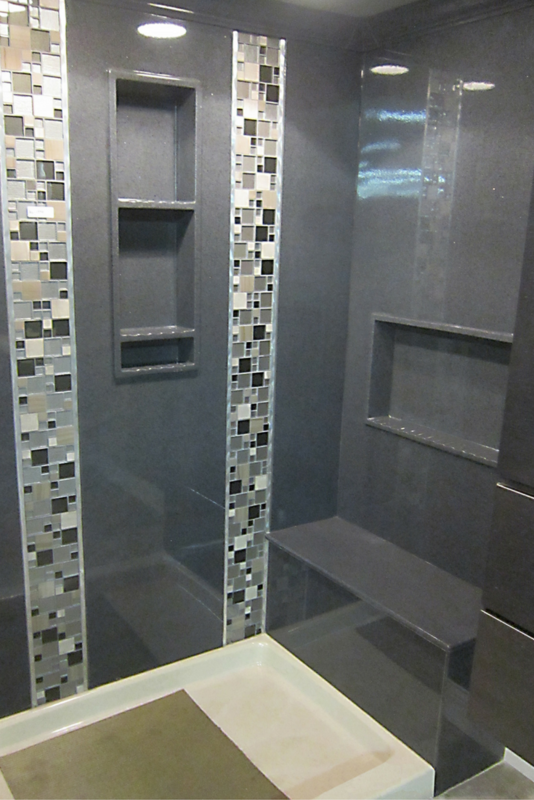 This one level wet room used a linear drain so the floor tiles could be larger! 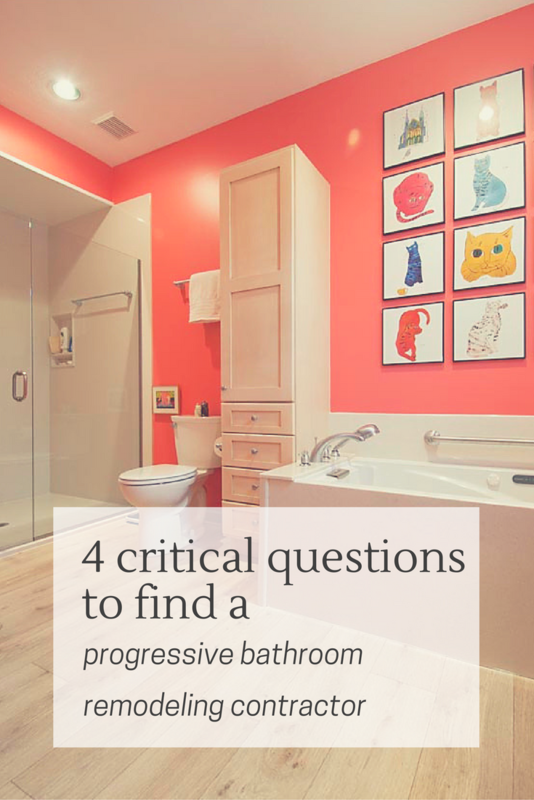 Do they suggest ways to improve lighting and make it easier and more spacious to get around the bathroom? If your potential contractor is clueless about these questions –move on. Critical question #4 – What kind of paperwork will we get through the process? I have to admit I have often jokingly said, “I’m allergic to forms, and if I had to be the one who filled out all the forms to adopt Parker and Jade (my 18-year-old son and 14-year-old daughter) we’d only have one son today (Grant – my 22-year-old son who came to use through biological birth).” While I’ll joke around about forms, I understand it’s essential in running a professional bathroom remodeling (or doing an adoption – a bit more important process than the remodeling job!) to use the right paperwork and be completely transparent through the process. In this project, you’ll want to make sure both you and the contractor are getting (and delivering) what’s expected. Ask your contractor what type of contract they use. Inquire how they handle the change order process. If your contractor is known for putting proposals on a yellow legal pad and doing change orders on the back of Subway wrappers this is not a good sign! 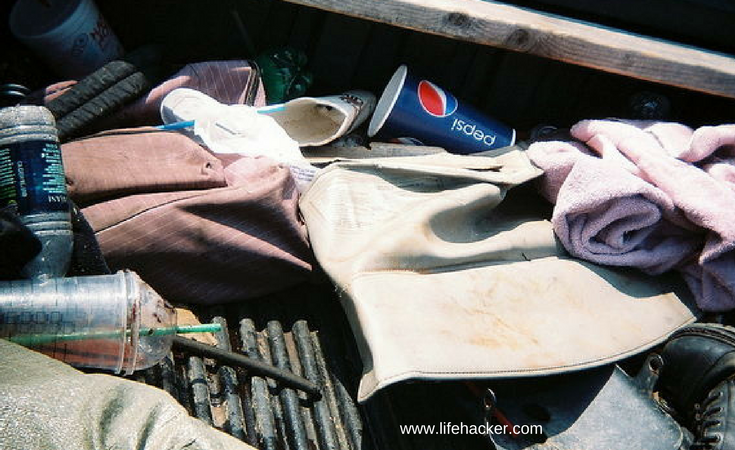 If the back of their truck looks like a disorganized mess like the image below also not a very positive sign. This “organization” system doesn’t bode well for a neat bathroom remodeling project! Don’t become another victim of a poorly organized, stuck-in-the-mud, unprofessional bathroom remodeling contractor. The key will be to be thorough and thoughtful in your process of interviewing people to do your job. Ask the 4 questions above. Don’t be afraid to ask. Quality contractors (who also employ quality people) will be patient and try to help you. If they aren’t patient and helpful you don’t want them anyway. 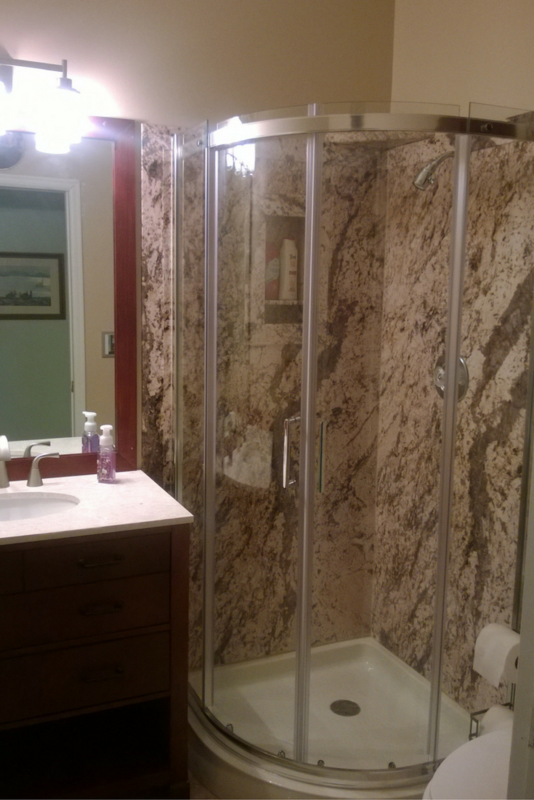 For an Akron or Cleveland bathroom remodeling project call Cleveland Design and Remodeling at 216-658-1270. In Columbus, The Bath Doctor at 614-252-7294. For nationwide supply of bathroom remodeling products like one level wet rooms and grout free shower wall panels contact Innovate Building Solutions at 877-668-5888. Mr. Foti, I enjoy your emails and products. Do you supply contractors in the San Antonio, TX area? Thanks Chas. I appreciate your retweet on Twitter!